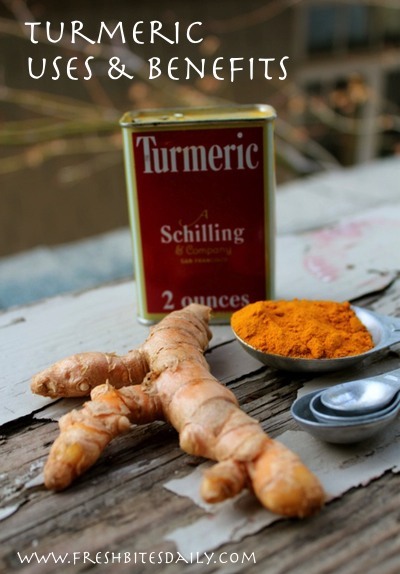 Turmeric Benefits, Uses – The weird and the wild! You have likely heard of turmeric benefits and its cancer-preventing and disease-inhibiting property curcumin, at least if you have eyes to read or ears to hear. It is now the most-studied spice on the planet. It has a long history of use in traditional medicine and increasingly is being recognized in western circles. We are here to tell you that as you get into turmeric benefits and curcumin, it’s an addiction that cannot be stopped. If you don’t want to find yourself experimenting with very-orange cauliflower, a bright orange face mask, orange paste in your refrigerator, or orange teeth, then you probably need to hit the “back button” right now and RUN!!! To tempt your taste buds just a bit, I’ll throw out some highlights with references to peer review journal articles. Find the journal articles at the end of the post and explore at your will tomorrow as you allow your orange face mask to dry…. Turmeric is a cancer-fighter: Curcumin in turmeric is probably most widely known for its anti-tumor properties, one of the potentially game-changing benefits. Just as examples, promising studies suggest that it fights cancer of the skin (Jee et al., 1998; Bush et al., 2001), breast (Mehta et al., 1997; Ramachandran and You, 1999; Simon et al., 1998; Verma et al., 1997; Choudhuri et al., 2002), colon (Hanif et al., 1997), and liver (Park et al., 2005), and prostate (Mukhopadhyay et al., 2001). Turmeric improves wound-healing: By both consuming more curcumin or using it topically in some circumstances, it may help wounds heal faster (Sidhu et al., 1998, Mani et al., 2002)). Turmeric may improve your muscle regeneration if you have had muscle injury in an accident, disease, surgery, etc. (Thaloor et al., 1999). Turmeric has a long history of use in traditional medicine, particularly in the Indian culture. This root may bring relief to many common problems. Drink turmeric if you have a cold. Make a turmeric milk heating up the milk with fresh root or powder. Sweeten with honey. You can use whatever type of milk works well for you. We are a dairy family but coconut milk would be an excellent base as well. Use a turmeric paste for insect bites. Simply add a bit of water to dried ground turmeric and apply it to the bite. If your household suffers from a raging case of “pink eye” (conjunctivitis), turmeric washes have been used to relieve the pain but we have not tried it and feel ever-so-hesitant — one part turmeric to twenty parts of water as an eye drop. Another option is to make that turmeric solution and use it in an eye compress — saturate a cloth with it and apply it to your eye. Make sure the cloth is one you do not mind turning orange. Should someone use it as an eye wash, do let us know. Drink turmeric if you suffer from allergies. Make a turmeric milk (or go dairy-free with coconut milk or even water depending on your allergies), heating up the milk with fresh root or powder. Add local honey for seasonal allergies. Sprinkle turmeric on a leech. *Shudder* Yes, the turmeric will apparently help cause the leech to remove itself if it is sprinkled with turmeric. May none of us ever know how well this therapy actually works…. If you suffer from vertigo (the “spinning room” feeling), try applying a turmeric paste on your forehead. Relieve your eczema or dermatitis with a turmeric paste. Apply a turmeric paste to your inflamed joints. Drink a turmeric milk to control diarrhea. 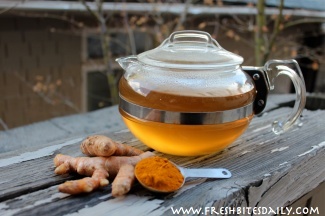 If you are fighting a fever, make a strong tea of turmeric. Consider adding ginger for flavor and peppercorns to improve the availability of the curcumin in the turmeric. Sweeten with honey and sip throughout the day. Try fresh turmeric juice for a stomachache, diluting with water and adding a bit of honey to make the “medicine” go down. Reduce skin inflammation with a turmeric paste, as in this eye inflammation case here. Apply a turmeric paste to your raging case of ringworm. Use a turmeric paste on your scars to reduce their appearance. As a cough syrup, add turmeric to a spoonful of honey. 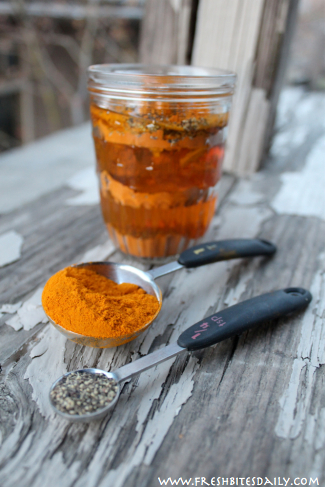 Eat more turmeric to improve your menorrhagia. Make a turmeric paste to manage pain from hemorrhoids. Use water as a base or even aloe vera gel to provide a bit more soothing relief. Use a paste of holy basil leaves and turmeric to relieve dental pain. Turmeric is contraindicated in people with bile duct obstruction, gallstones, hyperacidity, and stomach ulcers. If this applies to you, learn more about turmeric before using it beyond as an ingredient in your weekly curry. Younger women should know that there is some link between turmeric and infertility and would probably want to avoid supplementation usage. Traditional chai tea recipes were really onto something because they combined turmeric with black pepper and it turns out that the piperine in black pepper enhances the bioavailability of the curcumin (Shoba et al. 1998). How much black pepper is that? I can’t say it’s really clear. Studies are using isolated curcumin and piperine and it may be some time before we are given a recommendation close to “definitive,” but keep in mind that these studies focus on enhancing the use of curcumin as a supplement. They have found curcumin fairly ineffective as a supplement in isolation — it needs the piperine to make it into our bloodstream where it can do its job. In the context of eating turmeric (which is about 4% curcumin), we often already eat pepper along with it. It turns out that the ratios of the two used in these studies are in line with the way most of us probably eat anyway. It really does not take a lot of pepper — one study used something like an ounce of peppercorns to a pound of turmeric, just a sprinkle of pepper on your curry. What does this mean for our eating? Most dishes use pepper anyway. Double check yours. Add an extra sprinkle or two. More pepper isn’t going to hurt unless it makes the dish inedible to your palate (then you’ve defeated the purpose). Definitely look at your drink recipes. I don’t see it as obvious at all to add pepper to a turmeric milk or tea drink. I try to remind myself to do so and I still forget to add it at times. Perhaps more consumption of turmeric will sharpen my brain just a bit more in that department. 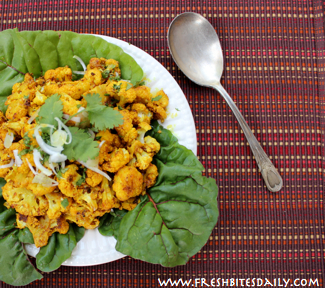 It’s worth the effort to find fresh turmeric if it’s possible. If you have an Indian grocery store near you, that may be your best bet. A more general Asian grocery store may carry it (though those near us do not). Increasingly you can find it at stores like Whole Foods and other independent health food stores. You can even buy it online, for example from our affiliate partner here. Buying it local in person will be better because you make sure it is fresh. In fact, I would not buy turmeric online during warm months. It would not travel well by mail. You will also want a stash of powdered turmeric for additional flexibility and ease of use. You can find it at any of the stores above. 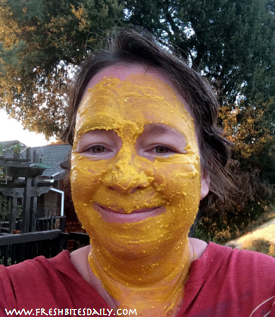 Turmeric paste for topical applications: Depending on your circumstances you can simply combine dried powder with water but recipes typically add a bit of a binder and a soothing agent as well. Yogurt or body butters are examples. Find a recipe for a body mask using shea butter here. 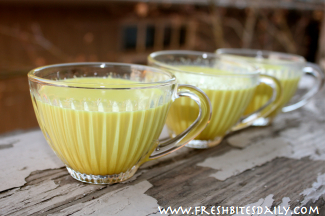 Turmeric milk: There are many “milk” variations. Our recipe combines milk and honey (here). Use the milk of your choice and add a bit of cinnamon with this one (here). Consider this coconut-based recipe (here). 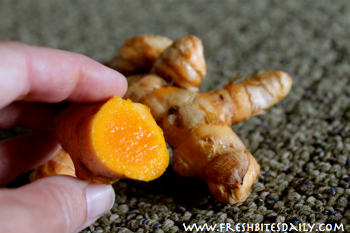 If you have fresh turmeric on hand, you simply cut it into small slices and infuse it, as I outline here. If you are using a powder, we really love this “tea kit” (here) that would work with any base — water, coconut milk, milk. Deserving a category of its own, you will basically seep turmeric in honey and then use the honey as a shot or to make a tea. Check out this power-packed idea here from Attainable-Sustainable.com. Ahuja, K. D., Kunde, D. A., Ball, M. J., & Geraghty, D. P. (2006). Effects of capsaicin, dihydrocapsaicin, and curcumin on copper-induced oxidation of human serum lipids. Journal of agricultural and food chemistry, 54(17), 6436-6439. Asai, A. and Miyazawa, T. (2001) Dietary curcuminoids prevent high-fat diet-induced lipid accumulation in rat liver and epididymal adipose tissue. J Nutr 131(11), 2932-2935. Choudhuri, T., Pal, S., Agwarwal, M.L., Das, T. and Sa, G. (2002) Curcumin induces apoptosis in human breast cancer cells through p53-dependent Bax induction. FEBS Lett 512(1-3), 334-340. Deodhar, S.D., Sethi, R. and Srimal, R.C. (1980) Preliminary study on antirheumatic activity of curcumin (diferuloyl methane). Indian J Med Res 71, 632-634. Dikshit, M., Rastogi, L., Shukla, R. and Srimal, R.C. (1995) Prevention of ischaemia-induced biochemical changes by curcumin & quinidine in the cat heart. Indian J Med Res 101, 31-35. Hanif, R., Qiao, L., Shiff, S.J. and Rigas, B. (1997) Curcumin, a natural plant phenolic food additive, inhibits cell proliferation and induces cell cycle changes in colon adenocarcinoma cell lines by a prostaglan-din-independent pathway. J Lab Clin Med 130(6), 576-584. Hussain, M.S. and Chandrasekhara, N. (1994) Biliary proteins from hepatic bile of rats fed curcumin or capsaicin inhibit cholesterol crystal nucleation in supersaturated model bile. Indian J Biochem Biophys 31(5), 407-412. Jee, S.H., Shen, S.C., Tseng, C.R., Chiu, H.C. and Kuo, M.L. (1998) Curcumin induces a p53-dependent apoptosis in human basal cell carcinoma cells. J Invest Dermatol 111(4), 656-661. Liacini, A., Sylvester, J., Li, W.Q. and Zafarullah, M. (2002) Inhibition of interleukin-1-stimulated MAP kinases, activating protein-1 (AP-1) and nuclear factor kappa B (NF-kappaB) transcription factors down-regulates matrix metalloproteinase gene expression in articular chondrocytes. Matrix Biol 21(3), 251-262. Mani, H., Sidhu, G.S., Kumari ,R., Gaddipati ,J.P., Seth, P. and Maheshwari, R.K. (2002) Curcumin differentially regulates TGF-beta1, its receptors and nitric oxide synthase during impaired wound healing. Biofactors 16(1-2), 29-43. Mehta, K., Pantazis, P., McQueen, T. and Aggarwal, B.B. (1997) Antiproliferative effect of curcumin (difer- uloylmethane) against human breast tumor cell lines. Anticancer Drugs 8(5), 470-81. Mukhopadhyay, A., Bueso-Ramos, C., Chatterjee, D., Pantazis, P. and Aggarwal, B.B. (2001) Curcumin downregulates cell survival mechanisms in human prostate cancer cell lines. Oncogene 20(52): 7597-7609. Naidu, K.A. and Thippeswamy, N.B. (2002) Inhibition of human low density lipoprotein oxidation by active principles from spices. Mol Cell Biochem 229(1-2), 19-23,. Nirmala, C., Anand, S. and Puvanakrishnan, R. (1999) Curcumin treatment modulates collagen metabolism in isoproterenol induced myocardial necrosis in rats. Mol Cell Biochem 197(1-2): 31-37. Park, S.D., Jung, J.H., Lee, H.W., Kwon, Y.M., Chung, K.H., Kim, M.G. and Kim, C.H. (2005) Zedoariae rhizoma and curcumin inhibits platelet-derived growth factor-induced proliferation of human hepatic myofibroblasts. Int Immunopharmacol 5(3), 555-569. Phan, T.T., Sun, L., Bay, B.H., Chan, S.Y. and Lee, S.T. (2003) Dietary compounds inhibit proliferation and contraction of keloid and hypertrophic scar-derived fibroblasts in vitro: therapeutic implication for excessive scarring. J Trauma 54(6), 1212-1224. Quiles, J.L., Aguilera, C., Mesa, M.D., Ramirez-Tortosa, M.C., Baro, L. and Gil, A. (1998) An ethanolic-aque- ous extract of Curcuma longa decreases the susceptibility of liver microsomes and mitochondria to lipid peroxidation in atherosclerotic rabbits. Biofactors 8(1-2), 51-57. Ramachandran, C. and You, W. (1999) Differential sensitivity of human mammary epithelial and breast carcinoma cell lines to curcumin. Breast Cancer Res Treat 54(3), 269-278. Ramirez-Tortosa, M.C., Mesa, M.D., Aguilera, M.C., Quiles, J.L., Baro, L., Ramirez-Tortosa, C.L., Martinez-Vic- toria, E. and Gil, A. (1999) Oral administration of a turmeric extract inhibits LDL oxidation and has hypocholesterolemic effects in rabbits with experimental atherosclerosis. Atherosclerosis 147(2), 371-378. Ringman, J. M., Frautschy, S. A., Cole, G. M., Masterman, D. L., & Cummings, J. L. (2005). A potential role of the curry spice curcumin in Alzheimer’s disease. Current Alzheimer Research, 2(2), 131. Salh, B., Assi, K., Templeman, V., Parhar, K., Owen, D., Gomez-Munoz, A. and Jacobson, K. (2003) Curcumin attenuates DNB-induced murine colitis. Am J Physiol Gastrointest Liver Physiol 285(1), G235-243. Sanmukhani, J., Satodia, V., Trivedi, J., Patel, T., Tiwari, D., Panchal, B., Goel, A. & Tripathi, C. B. (2013). Efficacy and safety of curcumin in major depressive disorder: a randomized controlled trial. Phytotherapy Research. Shubha, M. C., Reddy, R. R., & Srinivasan, K. (2011). Antilithogenic influence of dietary capsaicin and curcumin during experimental induction of cholesterol gallstone in mice. Applied Physiology, Nutrition, and Metabolism, 36(2), 201-209. Sidhu, G.S., Singh, A.K., Thaloor, D., Banaudha, K.K., Patnaik, G.K., Srimal, R.C. and Maheshwari, R.K (1998) Enhancement of wound healing by curcumin in animals. Wound Repair Regen 6(2), 167-177. Simon, A., Allais, D.P., Duroux, J.L., Basly, J.P., Durand-Fontanier, S. and Delage, C. (1998) Inhibitory effect of curcuminoids on MCF-7 cell proliferation and structure-activity relationships. Cancer Lett 129(1), 111-116. Soudamini, K.K., Unnikrishnan, M.C., Soni, K.B. and Kuttan, R. (1992) Inhibition of lipid peroxidation and cholesterol levels in mice by curcumin. Indian J Physiol Pharmacol 36(4), 239-243. Thaloor, D., Miller, K.J., Gephart, J., Mitchell, P.O. and Pavlath, G.K. (1999) Systemic administration of the NF-kappaB inhibitor curcumin stimulates muscle regeneration after traumatic injury. Am J Physiol 277(2 Pt 1), C320-329. Ukil, A., Maity, S., Karmakar, S., Datta, N., Vedasiromoni, J.R. and Das, P.K. (2003) Curcumin, the major component of food flavour turmeric, reduces mucosal injury in trinitrobenzene sulphonic acid-induced colitis. Br J Pharmacol 139(2), 209-218. Verma, S.P., Salamone, E. and Goldin, B. (1997) Curcumin and genistein, plant natural products, show synergistic inhibitory effects on the growth of human breast cancer MCF-7 cells induced by estrogenic pesticides. Biochem Biophys Res Commun 233(3), 692-6.